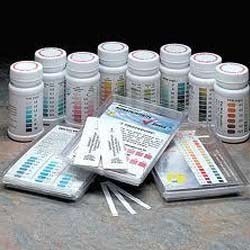 Blood chloride testing is often ordered, along with other electrolytes, as part of a regular physical to screen for a variety of conditions. These tests may also be ordered to help diagnose the cause of signs and symptoms such as prolonged vomiting, diarrhea, weakness, and respiratory distress. If an electrolyte imbalance is detected, the doctor will look for and address the disease, condition, or medication causing the imbalance and may order electrolyte testing at regular intervals to monitor the effectiveness of treatment. If an acid-base imbalance is suspected, the doctor may also order blood gas tests to further evaluate the severity and cause of the imbalance. In persons with too much base, urine chloride measurements can tell the doctor whether the cause is loss of salt (in cases of dehydration, vomiting, or use of diuretics, where urine chloride would be very low) or an excess of certain hormones such as cortisol or aldosterone (where urine chloride would be high). Urine tests for chloride are also used, along with sodium, to monitor persons put on a low-salt diet. If sodium and chloride levels are high, the doctor knows that the patient is not following the diet. S. Serum Analysis Centre Pvt. Ltd is one of the largest testing pathological referral laboratory provides specialized tests with international quality at affordable costs to the people across the nation. This pioneering networked laboratory in the Indian diagnostic industry was founded in the year 1999 to provide the health service at door steps. Serum has to satisfy the acute need based modern facilities specially in the field of Hormone Assay. Cythoisto-Pathology a treatment of allergy, apart from all other common and specialized clinical tests. The clinic here assembled a well knit team of highly qualified and trained professionals specialized in the field of Endocrinology, cell biology and Morbid Pathology to specifically diagnose and treat hormone disorder, allergy and other set backs. We have introduced a RADIO IMMUNO ASSAY (RIA), CHEMILUMINESCENCE (CLIA), PCR STUDY, FLOW CYTOMETRY, IMMUNO FLORE SCENCE ASSAY(IFA), BACTEC STUDY to boost up our range of accuracy. Growing at 200% compounded annual growth rate, it is today, India's best equipped clinical laboratory contributing significantly to the Indian diagnostic Industry, the company has entered its tenth year of operating and its services are now available across all the Indian states dedicated collection centres and franchisers which enables blood samples are to reach at our centralized processing laboratory.